8pm-12am between Stage 200 and 220 of Canvas the Castle, 12pm-8pm after Stage 220. Chanel is the Court of Chorrol's resident mage and is also an excellent painter. She is one of the major suspects in the quest Canvas the Castle. After you have completed the quest without having returned the painting, she will offer basic training in Destruction from noon to 8pm every day while she wanders around Chorrol (near the statue at the south gate). Life as a castle mage isn't exactly back-breaking, and Chanel can therefore take life on the easy side. After sleeping in her own personal bed in the Private Quarters between midnight and 6am, she strolls around for four hours before taking breakfast between 10am and midday. After eating, she will return to her pacing until her bedtime. On Sundas, she will skip breakfast to travel to the Chapel, where she will be found praying for two hours. Her schedule will suffer some alterations during and after the related quest. If you tell the Countess that Chanel wasn't involved, she will be delighted and will be found wandering around the Castle Great Hall from 8pm to midnight, at which point she will offer her services. After you have waited three weeks for the painting, at those times she will instead be found painting in the cramped West Tower. She will now also be found wandering around Fountain Gate between 12pm and 8pm, offering her services all the while. She wears a blue & green outfit with quilted shoes. She also carries tan linens, a medium-sized amount of gold, a paint brush, a Chorrol Castle Private Area key, and the Countess' key. She doesn't wield any weapons, relying instead on a leveled set of mage spells. 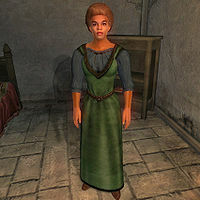 If you meet her for the first time, she'll introduce herself: "I'm Chanel, Chorrol Castle Mage. You'll tell me what you're here for. Right?" Afterwards she will greet you like this: "Welcome to Chorrol Castle. I am Chanel, the court mage. What brings you to me today?" 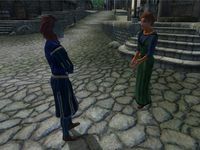 When you ask her about Chorrol, she will reflect her opinion: "We're simple, Gods-fearing folk here in County Chorrol. Easterners worship their wallets and their fat bellies." During Canvas the Castle, you'll have to question her. When you ask her what she knows about the investigation, she will say: "Yes, I have heard that the painting of the Count was taken. I was unaware she hired an outsider to conduct the investigation. May luck be with you." Should you ask her what she was doing on the night in question with a disposition lower than 60, she won't help you any further: "I am sorry. I don't really feel comfortable talking with you about that night. I barely know you." Otherwise she will tell you what she was doing: "The night that the painting was stolen, I was in the courtyard of the castle taking star readings. After a while, I decided to go into the dining area just off the Great Hall. I poured myself some wine and studied the charts I had made until it was time to sleep. From there, I went directly to my chamber and slept the rest of the night." She will tell you what she knows about the stolen painting when you ask her: "The stolen painting was of Count Valga. Whoever painted it could not do the man justice. He was kind and noble, which is difficult to convey on canvas. I am afraid other than that, I cannot offer much more information." At this point you can also accuse her, though it won't do you much good: "How dare you accuse me without enough evidence to back up your story! ", after which her disposition drops 20pts. After you've found enough evidence, it will strongly point you towards Chanel being the thief. When you accuse her with a disposition lower than 70, she won't add much information: "You have strong evidence, but I do not trust you enough to speak true my motivations." Otherwise, she will confess and explain why she stole the painting: "Very well. I confess to the crime. But please understand I only did it out of the great love I had in my heart for Count Valga. It was I that painted that portrait. When the Count was lost, the Countess spent so much time with it that I became jealous. I had to have the painting back, so I decided to steal it then hide it behind the painting in my quarters. I am ashamed of my crime, but ready to face what fate has in store for me." She will express further shame should you ask about the painting at this point: "I am ashamed that I took the painting, but my love for the Count was greater than you could imagine." Should you try to enter conversation again afterwards, she won't speak to you: "I understand the decision that you have made. And I accept my fate. Now please leave me to my thoughts." If you decided to let Chanel keep the painting, she will be overjoyed: "Words cannot to do justice for the joy I feel... many blessings upon you, my friend. I do not have much, but I wish to reward such valor. Return to me in three weeks, and I'll have a special painting for you. It is the least I can do for you." Before the three weeks have passed, she will greet you like this: "It is with the warmest regards I welcome you again, my friend. But you have returned a bit too early. I should have the painting done soon." When the three weeks have passed, she will reward you: "Welcome back, friend. Here is the painting. When you place it in your home and gaze upon it, may you always remember the deed you have done for me." After that, she will be overjoyed every time you greet her: "I am overjoyed at your return. What may I assist you with?" If you turn her in, however, she will disappear from the game.